It is a fact universally acknowledged that gardeners must wage a constant battle against weeds and various invaders that threaten to overwhelm their best beloveds. However, once in a while there comes an uninvited guest that is so welcome, so lovely, and so exactly in the right spot that all a gardener can do is say a silent prayer of thanks to the gardening gods. So it is with these wild daisies that somehow found their way into my garden in a spot where nothing else really thrived. 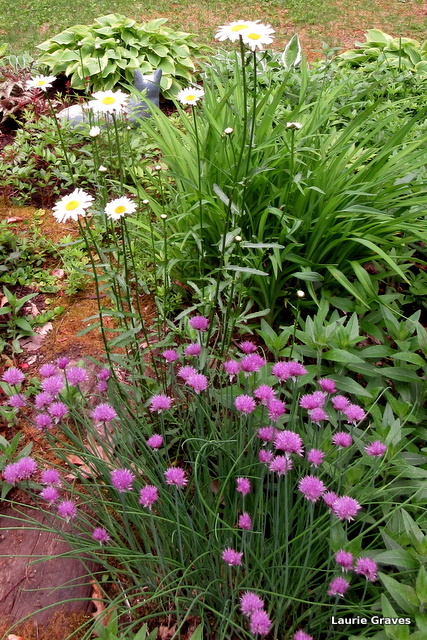 The daisies—tall, bright, and white—are exactly where they should be—in the middle of the garden. There, I hope, they will stay, and I will do my best to encourage them to thrive and spread. I like daisies. They look perfect in your garden. Thanks, Laura. How glad I am to have them there. Oh, happy days for me! When the seed heads dry, you can sow them where you want them to grow. Sometimes an uninvited guest is worth keeping around. Oh, yes! Especially when they are daisies. Carina, we both received a lovely gift from Mother Nature. They have earned their right to be there just out of their perseverance and endurance. 🙂 I often leave things in at least until they are done blooming because the pollinators and sometimes hummingbirds like them. Like you, I always let the old daisies grow. But then again, I see Queen Anne’s Lace as precious flowers, too! Thanks for sharing, Laurie. Cynthia, I love Queen Anne’s lace, too.